In the 34+ years since Brian Watson & Co., began we have instigated many changes for our clients businesses from creative sales and marketing strategies to intuitive business processes and systems development. In the process we have learned numerous computer languages and retained a broad understanding of legacy systems whilst keeping ahead of emerging trends. We specialise in Customer Relationship Management and Electronic Commerce helping our clients to acquire and retain customers. We design and build systems that improve business process and enhance profitability with robust database systems, e-commerce applications and associated web technologies playing an increasing role to support sales generation. For clients who lack computer skills we deliver close professional business relationships focussed on maximising their potential through effective training and exploitation of leading edge hardware and software computer systems and solutions. This dedication, vigilance and creative ability not only in the development of our clients, but also our own team, secures exceptional quality and ensures excellent customer service for all. Operating from Glasgow Brian Watson & Co., are Scottish Information Communication Technology Specialist with expertise in Web Design (including Electronic Commerce, Content Management Solutions, internet marketing, search engine optimisation and quality hosting), Database Development (Database Design, SQL Developement, Filemaker Developement) and business consultancy. Whether you need a a business process refined, a new database, a marketing strategy or new sales technique then you will want to know what to expect when consulting with Brian Watson & Co.
We begin our relationship with all new clients in a consultation phase. This is usually short but we will take as much time as needed if you have more complex needs. During this period we need to gather an understanding your requirements whilst giving you an opportunity to learn about our skills and abilities. We firmly believe in the principles of using our two ears and one mouth accordingly because only through attentive listening can we truly understand your needs and aspirations. We also understand that each industry has its own jargon and terminology and whilst we take time to understand your industry jargon we take care not to confuse you by using jargon that you might not be familiar with. We have yet to find two companies with identical needs and that is why we build innovative bespoke solutions for each client. We get to know your business and analyse your needs before putting forward our recommendation to build the right solutions to meet your exact requirements because we want to ensure that we deliver the best outcome for your business. We have pioneered many new technologies in our 30+ years, many of which have been patentable so we are well accustomed to thinking out of the box to create fresh ideas to help our clients achieve their desired outcome. All too often we hear of companies paying large amounts for what to all intents and purposes is an off the shelf open source solution. We have never done that! The development phase will begin with detailed data modelling and business process mock-ups to give you a visual representation of our proposed route. Only when you are happy do we proceed with the development. We find that making changes later is costly and causes delays so it is far better to verify that you are happy with the intended outcome before building. You might want us to stop at this phase so that you can obtain quotes from third parties. The detail we create should ensure that all such quotations you receive are to deliver the same outcome albeit the approach by each bidder might differ. On the other hand you might prefer, as most of our clients do, to engage us to complete the project. We always deliver on time and within our clients budget. We do not walk away when the project is complete; we remain at hand to provide on-going help and support as and when needed. If we developed a database or web application then you can rest assured that we have the capability to host and support your investment. We have invested in high performance servers and host these in the fastest data centres in the UK. This allows us to support our clients solutions and guarantee the best possible performance at all times. We also provide off site backups of all data held. So data in our primary data centre is replicated in two other UK locations. All data centres are owned and operated by UK based companies so you can be certain that your company will be compliant with UK and EU data protection laws. Our past projects have been very wide ranging but we hope the selection below will help highlight the diversity of our skills. or click the link to visit the clients web site to learn more about their business. 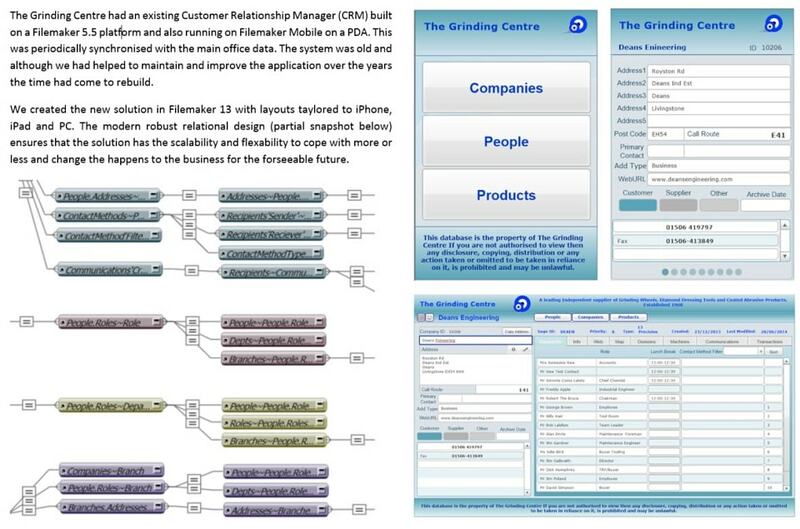 The Grinding Centre had an existing Customer Relationship Manager (CRM) built on a Filemaker 5.5 platform and also running on Filemaker Mobile on a PDA. 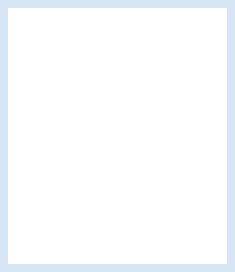 This was periodically synchronised with the main office data. The system was old and although we had helped to maintain and improve the application over the years the time had come to rebuild. We created the new solution in Filemaker 13 with layouts tailored to iPhone, iPad and PC. The modern robust relational design (partial snapshot below) ensures that the solution has the scalability and flexibility to cope with more or less and change the happens to the business for the foreseeable future. Click the spy glass to read about our work with The Grinding Centre or click the link to go to The Grinding Centres web site to learn more about our client. 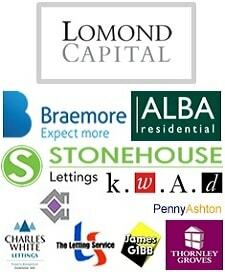 Lomond Capital, an investment consortium, planned to spend up to £45 million acquiring Residential Letting Agencies. They had recognised that in a market were demand for rental properties was high but funding for Landlords was being squeezed that there was an opportunity to grow through acquiring some of the 10,000 agents active in the UK market. There would be a natural economy of scale through market consolidation and centralising core activity. Changes introducing a custodial deposit scheme within Scotland presented an exceptional opportunity to rapidly expand in that region because many agents did not have their client fund readily to hand as the deadline was approaching. Brian Watson’s expertise in the property sector coupled to his knowledge of IT systems proved beneficial to Lomond not only in assisting in the due diligence process but also in appraising staff skills and understanding the different ways that disparate companies conduct what was to all intents and purposes is the same business process. Lomond Capital’s first acquisition was Braemore Property Management, a new town based company specialising in the executive end of the market, and this was shortly followed with adding the lettings portfolio from Slater Hogg. Next came The Lettings Service also trading as Premier Properties. At this time Brian took on a near full time role gathering all information needed to determine whether the business should continue as a standalone company or be integrated with another of Lomond’s acquisitions. The Letting Service specialised in student flats whereas Braemore and Premier were more geared towards the transient executive. 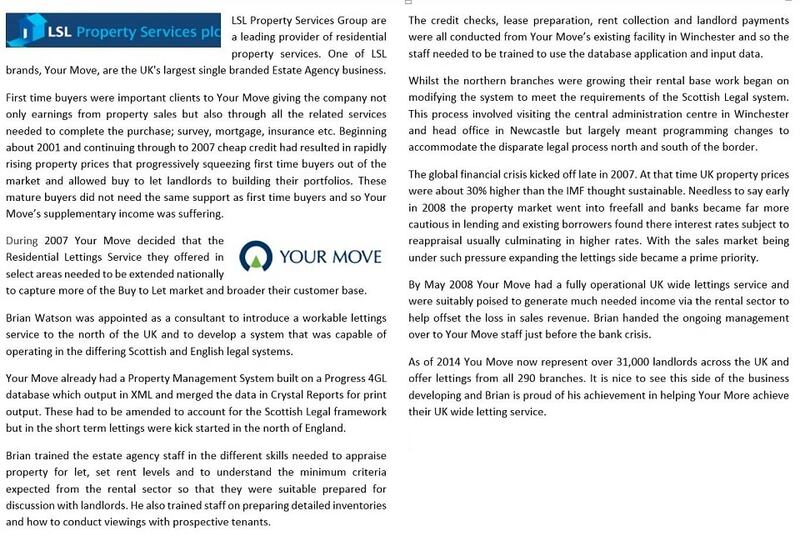 There were clear similarities between these businesses and a decision was reached to merge the smaller portfolio of Premier with that of Braemore and accept that for the time being this changed the profile of Braemore by also adding the Letting service portfolio. However, to retain each brand the web sites of both were maintained and led into the Braemore site as soon as a property search was conducted. This ensured those seeking any of the former businesses could still find their way to the new company. The acquisition of James Gibb and shortly thereafter Charles White Lomond met a new challenge. These long established companies specialise in Property Management and Factoring with Letting playing a relatively minor role to each. 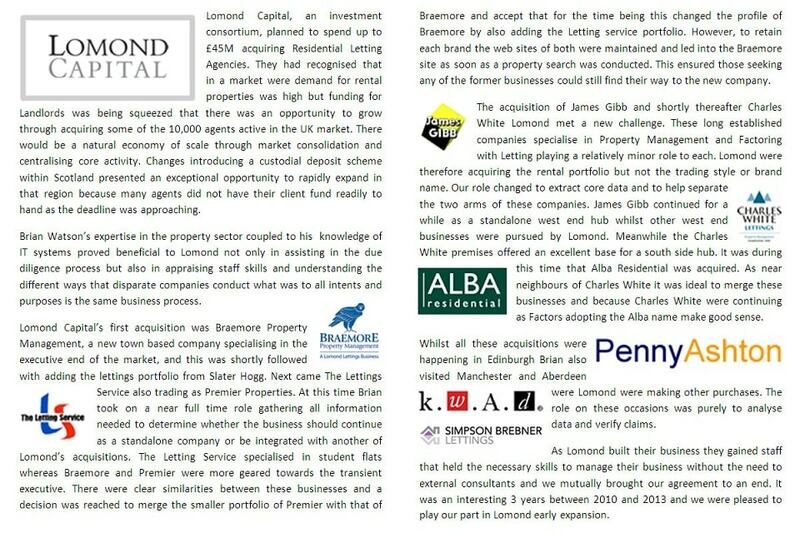 Lomond were therefore acquiring the rental portfolio but not the trading style or brand name. Our role changed to extract core data and to help separate the two arms of these companies. James Gibb continued for a while as a standalone west end hub whilst other west end businesses were pursued by Lomond. Meanwhile the Charles White premises offered an excellent base for a south side hub. It was during this time that Alba Residential was acquired. As near neighbours of Charles White it was ideal to merge these businesses and because Charles White were continuing as Factors adopting the Alba name make good sense. Whilst all these acquisitions were happening in Edinburgh Brian also visited Manchester and Aberdeen were Lomond were making other purchases. The role on these occasions was purely to analyse data and verify claims. As Lomond built their business they gained staff who held the necessary skills to manage their business without the need to external consultants and we mutually brought our agreement to an end. It was an interesting 3 years between 2010 and 2013 and we were pleased to play our part in Lomond early expansion. Click the spy glass to read about our work with Lomond Capital or click the link to go to Lomond Capitals web site to learn more about our client. 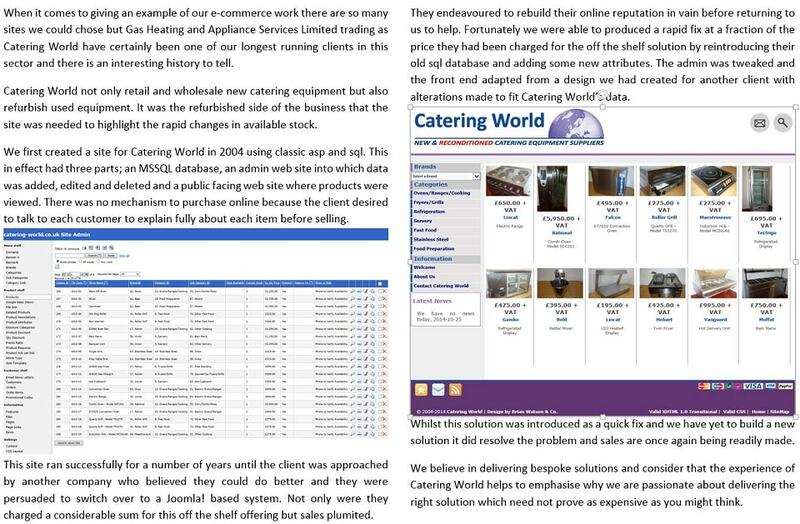 When it comes to giving an example of our e-commerce work there are so many sites we could chose but Gas Heating and Appliance Services Limited trading as Catering World have certainly been one of our longest running clients in this sector and there is an interesting history to tell. 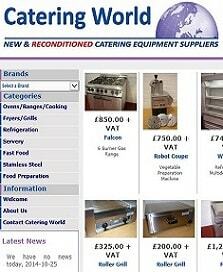 Catering World not only retail and wholesale new catering equipment but also refurbish used equipment. It was the refurbished side of the business that the site was needed to highlight the rapid changes in available stock. We first created a site for Catering World in 2004 using classic asp and sql. This in effect had three parts; an MSSQL database, an admin web site into which data was added, edited and deleted and a public facing web site where products were viewed. There was no mechanism to purchase online because the client desired to talk to each customer to explain fully about each item before selling. This site ran successfully for a number of years until the client was approached by another company who believed they could do better and they were persuaded to switch over to a Joomla! based system. Not only were they charged a considerable sum for this off the shelf offering but sales plummeted. They endeavoured to rebuild their online reputation in vain before returning to us to help. Fortunately we were able to produced a rapid fix at a fraction of the price they had been charged for the off the shelf solution by reintroducing their old sql database and adding some new attributes. The admin was tweaked and the front end adapted from a design we had created for another client with alterations made to fit Catering World's data. Whilst this solution was introduced as a quick fix and we have yet to build a new solution it did resolve the problem and sales are once again being readily made. We believe in delivering bespoke solutions and consider that the experience of Catering World helps to emphasise why we are passionate about delivering the right solution which need not prove as expensive as you might think. Click the spy glass to read about our work with Catering World or click the link to go to Catering World web site to learn more about our client. LSL Property Services Group are a leading provider of residential property services. 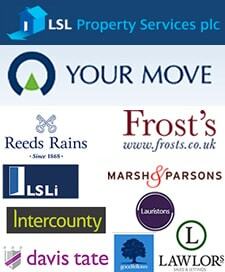 One of LSL brands, Your Move, are the UK's largest single branded Estate Agency business. First time buyers were important clients to Your Move giving the company not only earnings from property sales but also through all the related services needed to complete the purchase; survey, mortgage, insurance etc. Beginning about 2001 and continuing through to 2007 cheap credit had resulted in rapidly rising property prices that progressively squeezing first time buyers out of the market and allowed buy to let landlords to building their portfolios. These mature buyers did not need the same support as first time buyers and so Your Move’s supplementary income was suffering. During 2007 Your Move decided that the Residential Lettings Service they offered in select areas needed to be extended nationally to capture more of the Buy to Let market and broader their customer base. Brian Watson was appointed as a consultant to introduce a workable lettings service to the north of the UK and to develop a system that was capable of operating in the differing Scottish and English legal systems. Your Move already had a Property Management System built on a Progress 4GL database which output in XML and merged the data in Crystal Reports for print output. These had to be amended to account for the Scottish Legal framework but in the short term lettings were kick in the north of England. Brian trained the estate agency staff in the different skills needed to appraise property for let, set rent levels and to understand the minimum criteria expected from the rental sector so that they were suitable prepared for discussion with landlords. He also trained staff on preparing detailed inventories and how to conduct viewings with prospective tenants. The credit checks, lease preparation, rent collection and landlord payments were all conducted from Your Move’s existing facility in Winchester and so the staff needed to be trained to use the database application and input data. Whilst the northern branches were growing their rental base work began on modifying the system to meet the requirements of the Scottish Legal system. This process involved visiting the central administration centre in Winchester and head office in Newcastle but largely meant programming changes to accommodate the disparate legal process north and south of the border. The global financial crisis kicked off late in 2007. At that time UK property prices were about 30% higher than the IMF thought sustainable. Needless to say early in 2008 the property market went into free-fall and banks became far more cautious in lending and existing borrowers found there interest rates subject to reappraisal usually culminating in higher rates. With the sales market being under such pressure expanding the lettings side became a prime priority. By May 2008 Your Move had a fully operational UK wide lettings service and were suitably poised to generate much needed income via the rental sector to help offset the loss in sales revenue. Brian handed the on-going management over to Your Move staff just before the bank crisis. As of 2014 You Move now represent over 31,000 landlords across the UK and offer lettings from all 290 branches. It is nice to see this side of the business developing and Brian is proud of his achievement in helping Your More achieve their UK wide letting service. Click the spy glass to read about our work with LSL or click the link to go to LSL web site to learn more about our client. The Institute of Advanced Motorists (IAM) is the UK’s leading independent road safety charity. The IAM strive to make Britain’s roads safer by enhancing the skills of these who use them. 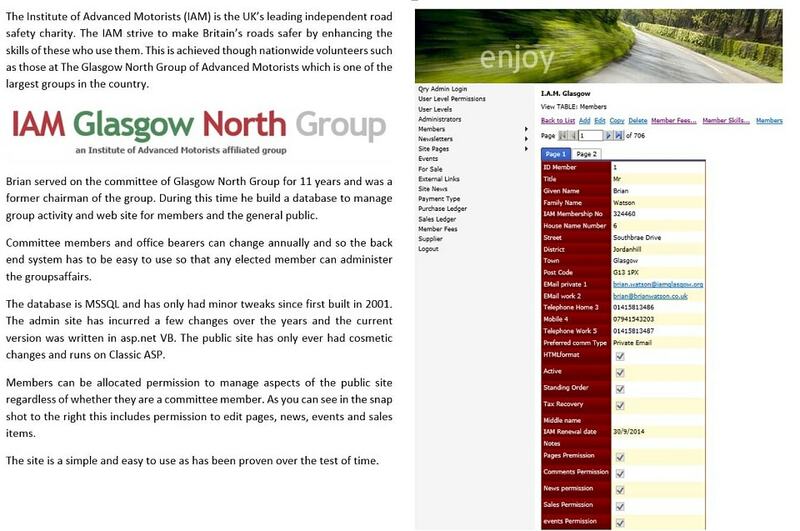 This is achieved though nationwide volunteers such as those at The Glasgow North Group of Advanced Motorists which is one of the largest groups in the country. Brian served on the committee of Glasgow North Group for 11 years and was a former chairman of the group. 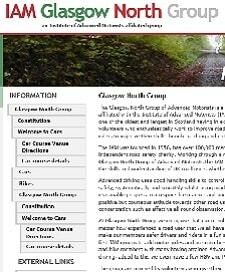 During this time he developed a database to manage group activity and web site for members and the general public. Committee members and office bearers can change annually and so the back end system has to be easy to use so that any elected member can administer the groups affairs. The core Microsoft SQL database and has only had minor tweaks since first built in 2001. The admin site has incurred a few changes over the years and the current version was written in asp.net VB. The public site has only ever had cosmetic changes and runs on Classic ASP. Members can be allocated permission to manage aspects of the public site regardless of whether they are a committee member. As you can see in the snap shot to the right this includes permission to edit pages, news, events and sales items. The site is a simple and easy to use as has been proven over the test of time. Click the spy glass to read about our work with Glasgow North Group or click the link to go to IAM Glasgow web site to learn more about our client. Richard Bowles at Data Clarity www.data-clarity.co.uk approached us to see if we could help his client whose businesses were quite diverse being book publishers and retailers. The retail side needed an online database supported because they had been regularly let down by their existing supplier. It was imperative that the data remained available 24/7. More importantly as the database was built in Filemaker they needed someone who understood the product to offer an appropriate support mechanism to handle any problems that might arise from time to time. 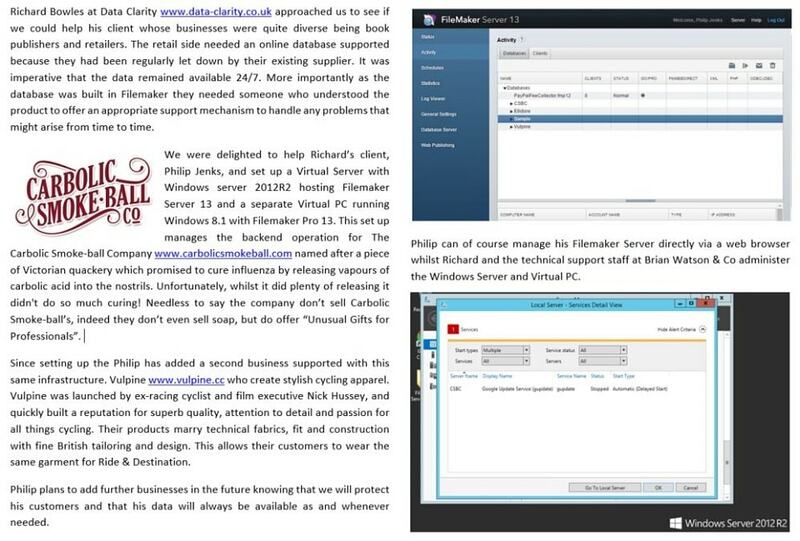 We were delighted to help Richard’s client, Philip Jenks, and set up a Virtual Server with Windows server 2012R2 hosting Filemaker Server 13 and a separate Virtual PC running Windows 8.1 with Filemaker Pro 13. This set up manages the backend operation for The Carbolic Smoke-ball Company www.carbolicsmokeball.com named after a piece of Victorian quackery which promised to cure influenza by releasing vapours of carbolic acid into the nostrils. Unfortunately, whilst it did plenty of releasing it didn't do so much curing! Needless to say the company don’t sell Carbolic Smoke-ball’s, indeed they don’t even sell soap, but do offer "Unusual Gifts for Professionals". Since setting up the Philip has added a second business supported with this same infrastructure. Vulpine www.vulpine.cc who create stylish cycling apparel. Vulpine was launched by ex-racing cyclist and film executive Nick Hussey, and quickly built a reputation for superb quality, attention to detail and passion for all things cycling. Their products marry technical fabrics, fit and construction with fine British tailoring and design. This allows their customers to wear the same garment for Ride & Destination. Philip plans to add further businesses in the future knowing that we will protect his customers and that his data will always be available as and whenever needed. Philip can of course manage his Filemaker Server directly via a web browser whilst Richard and the technical support staff at Brian Watson & Co administer the Windows Server and Virtual PC. 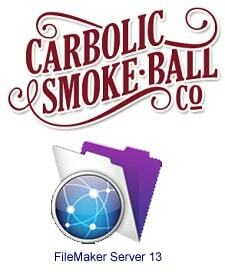 Click the spy glass to read about our work with The Carbolic Smoke-ball Co. or click the link to go to The Carbolic Smoke-ball Co. web site to learn more about our client. 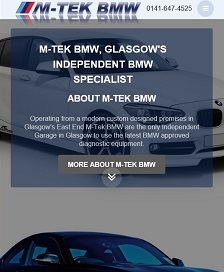 M-Tek BMW have been our clients since 2004 and over the years we have updated their site a few times. The current version is a content managed solution Back in 2003 Alan Coyle approached Brian Watson & Co to build an online game based on Motorcycle Speedway. This game recorded the results from real spedway events to allow those playing the game to build fantasy teams and participate in the Fantasy Speedway League. www.fantasy-speedway.com was launched for the 2004 season and has continued ever since. The core game has remained but a few additional prize winning opportunities have been added over the years. Speedway Star Magazine ran a mail based game and liked what we had created. 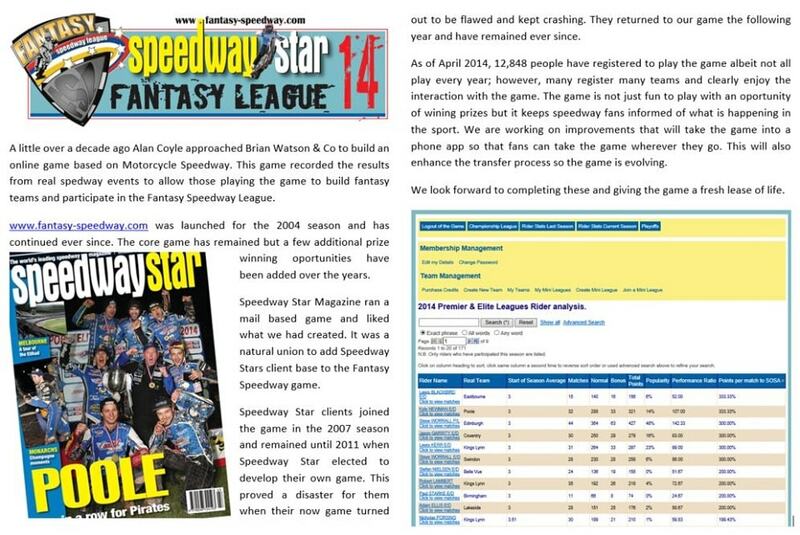 It was a natural union to add Speedway Stars client base to the Fantasy Speedway game. Speedway Star clients joined the game in the 2007 season and remained until 2011 when Speedway Star elected to develop their own game. This proved a disaster for them when their now game turned out to be flawed and kept crashing. They returned to our game the following year and have remained ever since. As of April 2014, 12,848 people have registered to play the game albeit not all play every year; however, many register many teams and clearly enjoy the interaction with the game. The game is not just fun to play with an opportunity of wining prizes but it keeps speedway fans informed of what is happening in the sport. We are working on improvements that will take the game into a phone app so that fans can take the game wherever they go. This will also enhance the transfer process so the game is evolving. We look forward to completing these and giving the game a fresh lease of life. Click the spy glass to read about our work with M-Tek BMW or click the link to go to M-Tek BMW web site to learn more about our client. 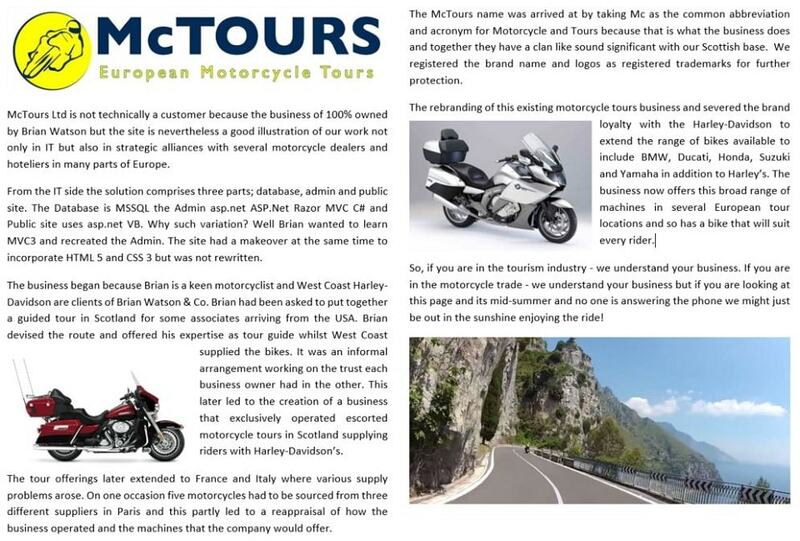 McTours Ltd is not technically a customer because the business of 100% owned by Brian Watson but the site is nevertheless a good illustration of our work not only in IT but also in strategic alliances with several motorcycle dealers and hoteliers in many parts of Europe. From the IT side the solution comprises three parts; database, admin and public site. The Database is MSSQL the Admin asp.net ASP.Net Razor MVC C# and Public site uses asp.net VB. Why such variation? Well Brian wanted to learn MVC3 and recreated the Admin. The site had a makeover at the same time to incorporate HTML 5 and CSS 3 but was not rewritten. 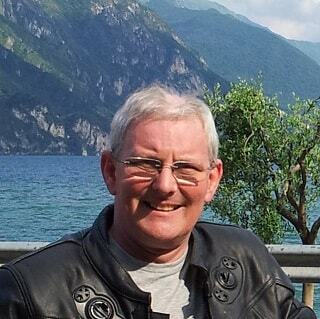 The business began because Brian is a keen motorcyclist and West Coast Harley-Davidson are clients of Brian Watson & Co. Brian had been asked to put together a guided tour in Scotland for some associates arriving from the USA. Brian devised the route and offered his expertise as tour guide whilst West Coast supplied the bikes. It was an informal arrangement working on the trust each business owner had in the other. This later led to the creation of a business that exclusively operated escorted motorcycle tours in Scotland supplying riders with Harley-Davidson’s. The tour offerings later extended to France and Italy where various supply problems arose. On one occasion five motorcycles had to be sourced from three different suppliers in Paris and this partly led to a reappraisal of how the business operated and the machines that the company would offer. 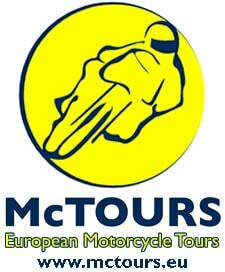 The McTours name was arrived at by taking Mc as the common abbreviation and acronym for Motorcycle and Tours because that is what the business does and together they have a clan like sound significant with our Scottish base. We registered the brand name and logos as registered trademarks for further protection. The rebranding of this existing motorcycle tours business and severed the brand loyalty with the Harley-Davidson to extend the range of bikes available to include BMW, Ducati, Honda, Suzuki and Yamaha in addition to Harley’s. The business now offers this broad range of machines in several European tour locations and so has a bike that will suit every rider. So, if you are in the tourism industry - we understand your business. If you are in the motorcycle trade - we understand your business but if you are looking at this page and its mid-summer and no one is answering the phone we might just be out in the sunshine enjoying the ride! Click the spy glass to read about our work with McTours Ltd or click the link to go to McTours web site to learn more about our client. We first started to document, improve and perfect business processes for BSI purposes. We have since undertaken this task for companies needing a definitive user manual when considering franchising or for ISO certification purposes. Often we find that a business has what they believe is the best way to do a task and over the years this task has been performed they are usually right but occasionally when we question why it is done this way rather than an alternative we soon realise that there might be a better way. Contact us for a consultation to learn more. We are highly skilled in many Relational Database Management Systems and primarily programme in SQL variants. We have extensive experience with MSSQL and Filemaker Pro (mainly 7-11, 12 & 13 but we can still support older systems). We have considerable knowledge of Dbase, DB2, DB2/2, FoxPro, FoxPro for Windows, Visual FoxPro, IDB, Informix, Interbase, Progress 4GL, MS Access, MySQL, Oracle, PostrgreSQL, Sybase, XML and more. In short if you need us to do something with your data we can do it in almost any system. If you need something programmed in a language we don't already know we are always willing to get a book and learn. How do you think we already gained skills in the aforementioned technologies! So whatever you want developed get in touch so that we can discuss your needs further. Optimising your site to get the best search engine results is a fickle business. No sooner have you found the right blend of words in the content, written the best performing descriptive phrase and found the ideal balance of keywords and then Google changes their algorithm! SEO is a constant task but some things rarely change and if we get these right your performance will be well above average making the performance less susceptible to search engine changes. As an added bonus most clients find that this approach generates quality rather than quantity leads which generally produces more sales. Todays electronic marketing allows you to reach potential customers at the lowest of cost but this also means that having found you, the potential customer can easily get price comparisons from your competitors. You therefore need a unique selling point and that will rarely be based on you having the lowest prices. We will help you devise a better way to promote your USP's to maximise your online sales. We have been involved in sales for more 40 years and have devised a plethora of techniques over the years so we are just as comfortable advising of traditional sales methods as the latest online strategies. We have heavily invested in high specification servers and located them in the fastest data centres in the UK. With 1Gb/s internet connection at each server we can deliver near unlimited bandwidth at the fastest speed. We offer shared hosting purely to client solutions that we have built, we also offer dedicated hosting for both solutions that we have created and those clients simply wish hosted in a quality high speed environment. We can host data in any one of our three separate UK locations and off site backup in any of the others to give ultimate peace of mind and protection. With an MSc in Electronic Commerce and over 40 years in sales and marketing Brian has the skills to drive your online business strategy. I love to be challenged and to solve problems. This can be in wide and varied areas such as leveraging technology to refine a specific task or set of tasks, devising a new sales technique, marketing strategy or generally looking at ways to be more productive or more profitable. I was first introduced to computing in the late 60's to early 70's when I learnt Cobol and Fortran at school. My first commercial use of this code was to output perfect circles and arcs to the plotter in one of the world’s first Automated Drafting Machines, better still this was generated in just a few lines of Cobol rather than the numerous co-ordinates needed to generate a series of dots as used in earlier prototypes and indeed to this day in many forms of printing. Since then I have devised code used in Navigation, Electronic Point Of Sale (EPOS and EFTPOS) for Retail, intelligent tag used for inventory control and hands free access control but by far the bulk of my work has been in processing data. My Masters degree is in Electronic Commerce Technology and since acquiring this in 2001 I have created numerous database applications and web systems. On the sales front I have extensive experience in generating new business being a top produces in companies like Rank Xerox where i worked prior to setting up my own business. I have also used these sales skills to develop my businesses and help other businesses to grow and retain customers. This is especially true in the property sector where I spent 16 years building a UK wide chain of Letting Agencies during this time I also developed a unique marketing plan that assisted local authority tenants to purchase and improve their homes and my World Homes Network project was the first property portal site in the world when launched in 1996 and Home Sales & Letting Direct the first virtual estate agency launched in 1998. I have consulted with the UK's largest single branded Estate Agency chain to introduce lettings to their branches and acted as a consultant to an investment consortium who are acquiring letting agencies. Many smaller agents have also benefited from my knowledge and expertise over the years. Although I have a comprehensive range of skills and interests I also have access to a broader range of expertise through my associates. Brian Watson & Co., are therefore capable of finding solutions to many business challenges and I look forward to hearing from you to see what we can do to help solve your problem or improve your matters for you business. Brian Watson & Co is a Scottish business consultancy that has been innovating for over 30 years in database and web technologies specifically in the property sector. We offer analysis, design, SEO and Internet marketing, hosting and support. Our key services include: Web Design Glasgow, Database Development Scotland, Database Development Glasgow, Scottish SQL Developer, Glasgow Filemaker Developer, Filemaker Developers Scotland, Information Communication Technology Scotland, Glasgow Business Consultant, Glasgow e-commerce, Database Design, Electronic Commerce, Content Managed Solutions, Quality Web Hosting, Cloud Computing, web site designers, web site design, Internet marketing, search engine optimisation.